Since I'm exercising my thriftiness. 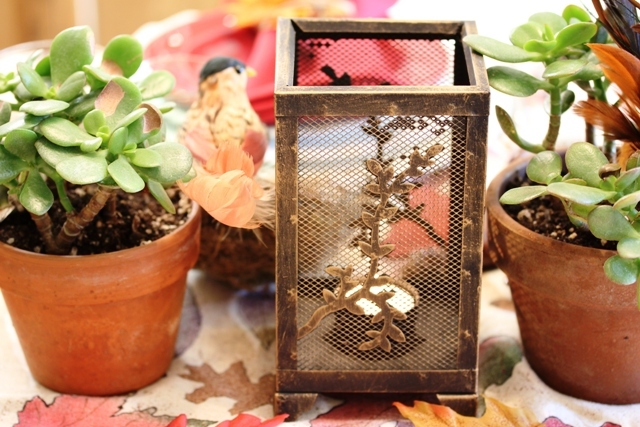 I've had a great time shopping for the components to use in this tablescape. I found the candle holder in a thrift shop for 2 dollars. 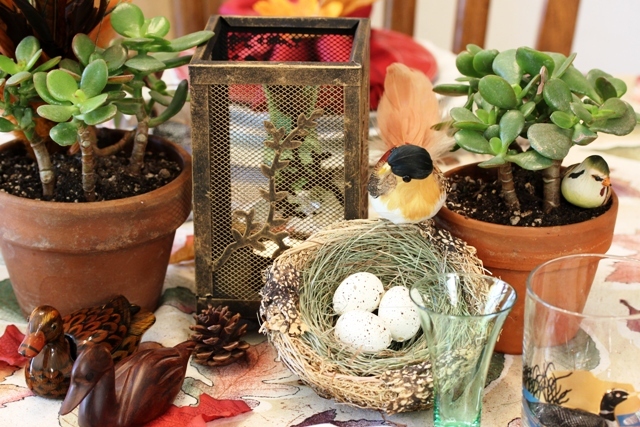 It was my inspiration to carry out a natural theme for this tablescape. 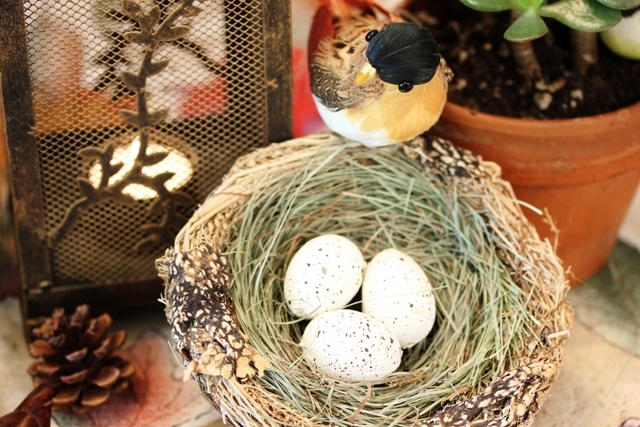 Last week I took a day trip to my favorite store Click Here for their Christmas Open House and found the feathers, bird nest and the large bird. 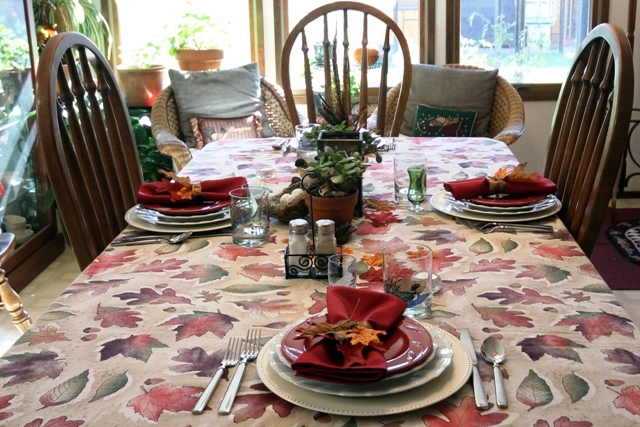 The tablecloth is vintage and I just bought the jade plants last week to put in the house for the winter. I will plant them in two big urns next spring. I'm always thinking about next year's garden. I'm so sorry I digressed. 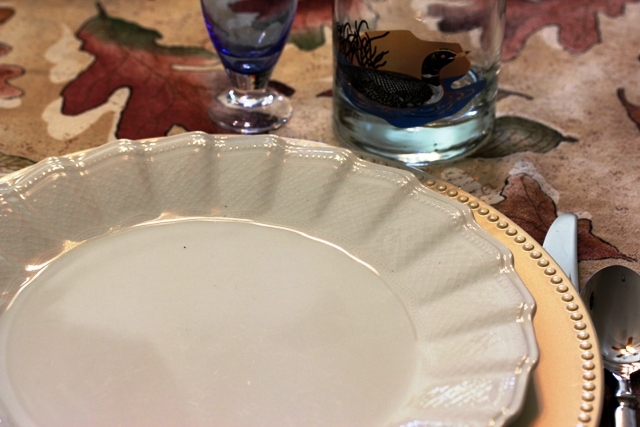 Now - back to the tablescape. 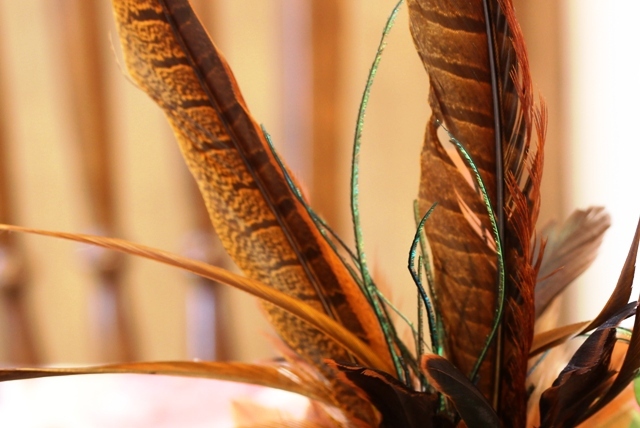 I just love these feathers. The napkin ring idea was in a Bliss Victoria magazine, September/October 2008. The wax thine, ribbon and faux leaves I bought at the craft store. And, the napkins I bought at Big Lots my other favorite store. Wine colored plates are from the DT. The flatware is used everyday. 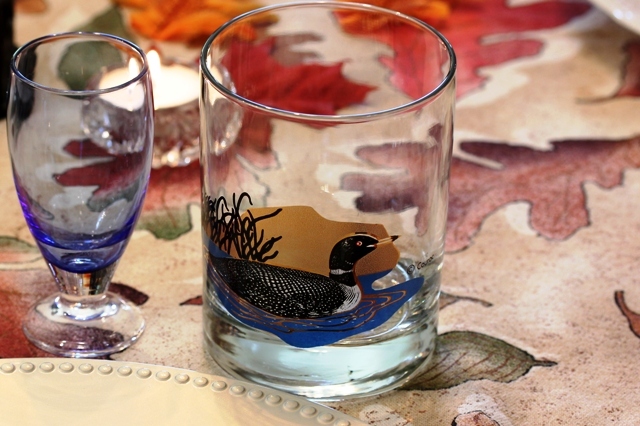 The glass with the beautiful duck is part of a gift set from my oldest son about 30 years ago and the cordial glass is part of a set of six, each in a different color. They are so delicate. 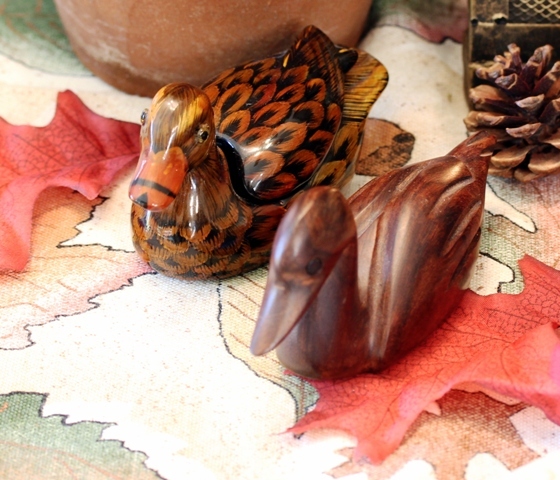 I bought the little wooden duck from a young boy in Mexico and I have no idea where I bought the little glass duck. It could have been a gift. Sorry, I don't remember. I'm joining a great group of memes. 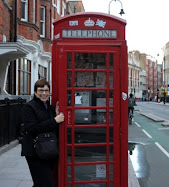 Please link back to their posts and check out the other delightful blogs. Lovely table. I love the white ruffled plates. Would you check the back to see if there is a mark? They are so delicate and sweet. Thanks for sharing. I love all the natural details you included on your table. You have set such a wonderful feeling of fall. Oh, that napkin arrangement is simply gorgeous! It really MAKES the table! 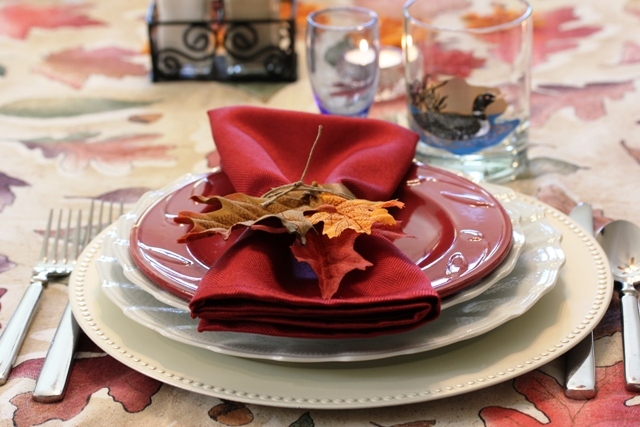 Your placesetting looks ready for a magazine shoot! 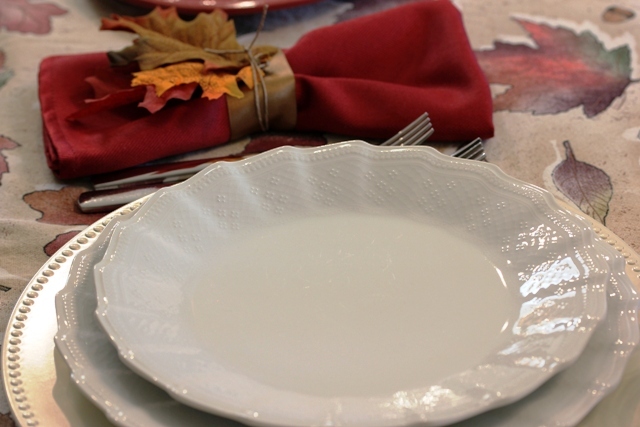 Pretty tablecloth, and love the way you layered the plates, the ruffle look white one is really pretty, as is the red. Like how you did the napkins as well. Very nice!! Beautiful. Feathers are my favorite! Love the plates and the little nest is precious. Very pretty, I love the napkin rings and your dishes are lovely! Those ruffly plates ARE gorgeous!!! Wow! And, yes...the pheasant feathers are a hit! Your ruffled plates are lovely. Like your ducks too! Happy Pink Saturday and enjoy yourr weekend. Gorgeous tablescape!! I love it. I have always wished I was talented enough to pull off a pretty tablescape! I've seen the jade plants here in my neighborhood. I've always thought they are so pretty...do you know if they are fairly simple to care for? That is a lovely table. Love all the colors and natural elements. It looks so welcoming! Thanks for sharing your beautiful table! 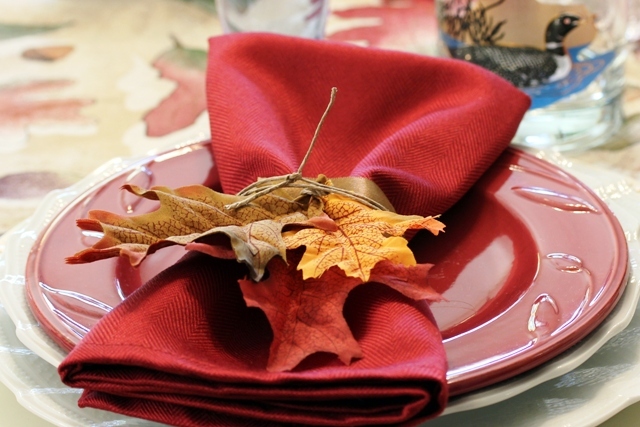 Lovely Fall tablescape! I especially like those duck glasses! 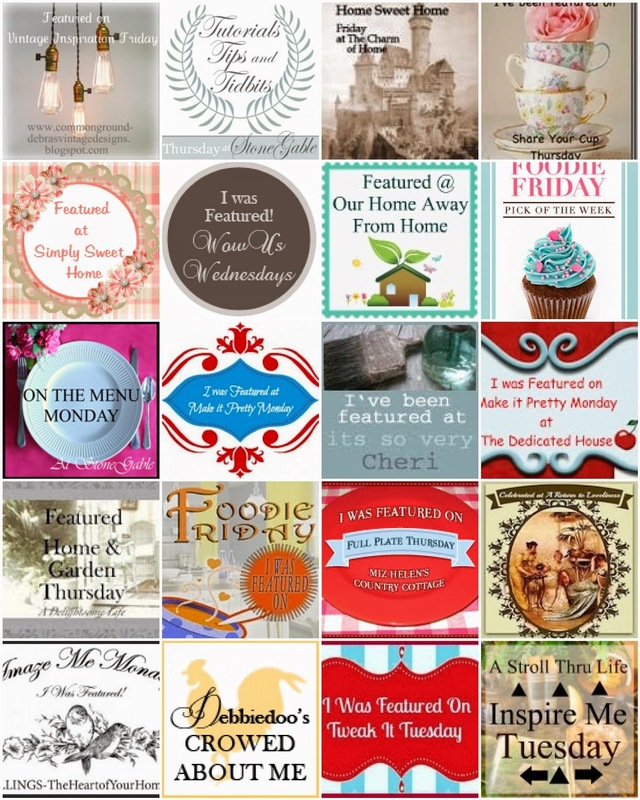 I enjoyed your holiday sharing tablescape. 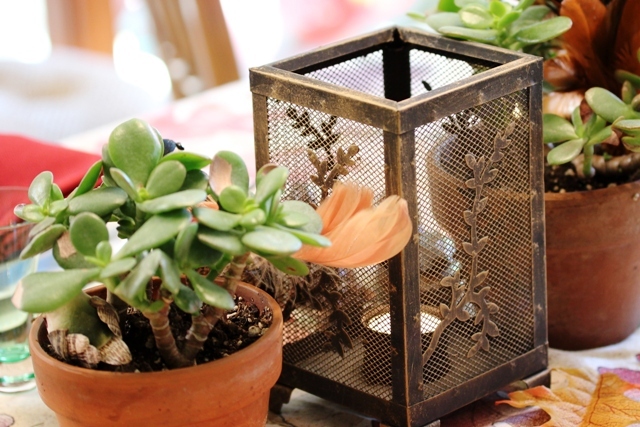 Your tablescape is just charming. I'm sure your granddaughters will love it. Such a warm and welcoming table. 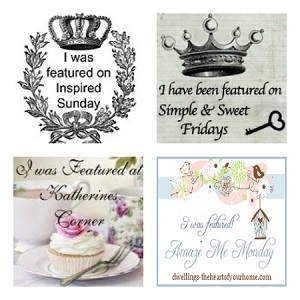 Thank you for sharing your seasonal spirit with Seasonal Sundays! What a pretty table! I love the feathers. I'm surprised you've managed to keep those duck glasses for 30 years. Other than the stuff in the china cabinet that is never used, we rarely keep things more than a few years at most. Really like your jade plants. I have one too. Also like how you incorporated the bird nest and feathers for a festive natural look. 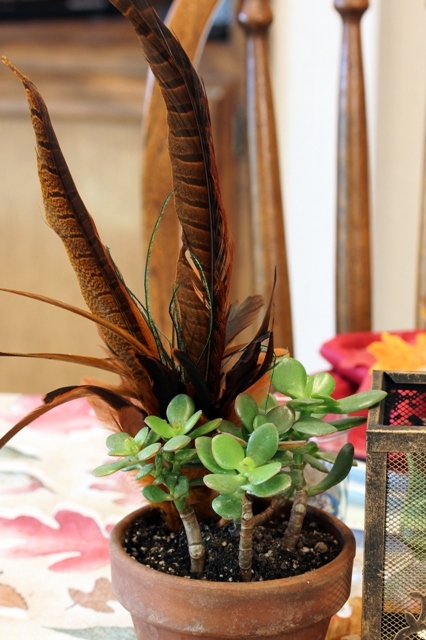 What a fun and inviting Autumn table! I really like the napkin ring idea! And the duck glasses are wonderful! How pretty...your napkin rings are so festive!